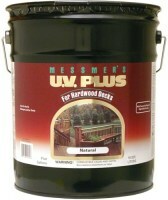 how to apply the product to the hardwood for quick drying. Brush rag roller? 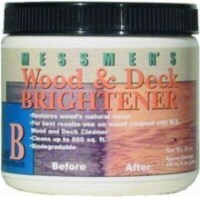 Use the regular Messmers for Cedar wood. Clean and brighten the wood for prep. What preparation is required to use Messieurs on new cedar? 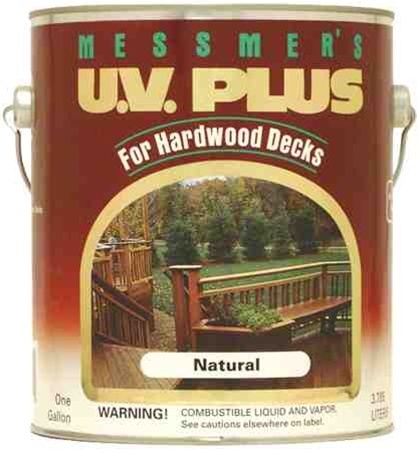 Which Messmer product do you recommend for cedar? Hard to say. If it is an opened container then it probably has gone bad. Yes it does settle. 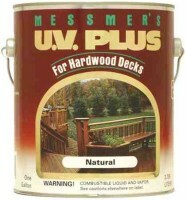 I have a 5 gallon container of Messmers hardwoods in the natural color that has been stored in the garage for 2 yrs. The temp doesn't go below freezeing. Is it still good to use? Also, does it have a pigment that settles and needs to be stired? All new wood needs to be prepped first before staining. 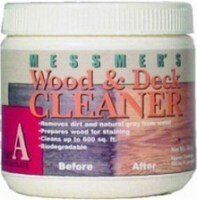 Using a wood cleaner and a wood brightener is best to remove the mill glaze and "open" the wood pores. I'm building a 900 SFT Ipe deck this summer. I started laying decking on June 27th. Due to weather and limited work time, I'll be getting the last courses in at the end of this week (July 23) and putting on Messmers UV Plus for Hardwood natural sealant next week, so the boards have been out in the elements for about a month. Should I use the cleaner/brightener before my first application? I have lots of fir trees overhead with some minor pitch fall on one section, but other than that, the wood is clean. Also, I have scrubbed all the joints with dish detergent and a low-scratch scrubbing sponge to remove the excess anchor seal from the board surface. Do I need to do more before applying the UV Plus to get good coverage at the joints?